Discover the other half of the college experience! Your tuition fees include a membership to the College’s fitness centers at both the New Westminster and Coquitlam campuses. Fitness classes such as yoga and pilates, zumba, core strength, and boot camp, are offered at both campuses. Hours of operation are listed online. The Douglas College Student Union clubs are a great way to get involved and make new friends. There’s the Business Association, the Photography Club, and the International Association to name a few. Get the complete list on the DSU website. Believe it or not, students who invest their free time in getting involved on campus are more likely to do well academically. Get Oriented: There are a few key steps that all successful students take to get settled at the College. Visit the new Student Life blog, Life at DC, to learn about these steps from your fellow students who’ve been there, done that. 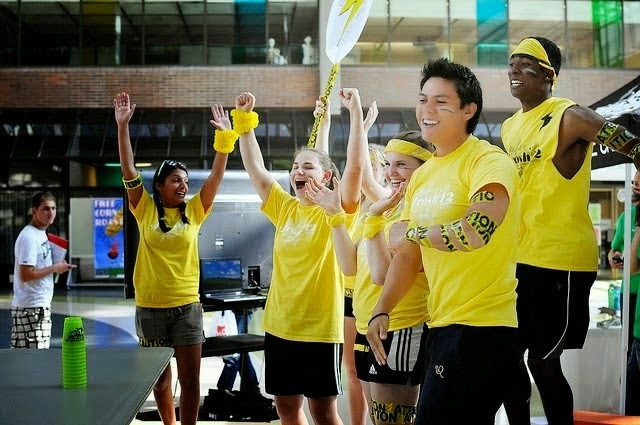 Get involved: There are lots of college events and programs that you can join, and if you do, you’ll meet new people. We want you to find a sense of community at Douglas College. Get Healthy: You need to be well to do well. Getting exercise, maintaining a healthy diet, and taking good care of your mental health will set you up for academic success. Get Experience: You want to graduate with a resume that grabs attention and gets you hired; we want to help you! Getting involved on campus, being a student leader, and working in Student Life are great ways to get experience, and these things will show employers what you’re capable of. Don’t be the last to know what’s happening at Douglas College! Follow Student Life on Facebook, Twitter, Instagram and the Life at DC blog.